New York, NY -- (SBWIRE) -- 10/10/2013 -- Life is what it is, and sometimes the pain, the unusual twists and turns of it are unavoidable, though through its entirety one must always smile, for this is a great start of the healing process. Author Michael Soward has lived by these words, and in his new book, â€œLife-ology 101,â€� he shares his life journey with readers everywhere, giving them a brief written snapshot of his life from childhood to his arrival in New York City, and all the adversities he met and overcame along the way. 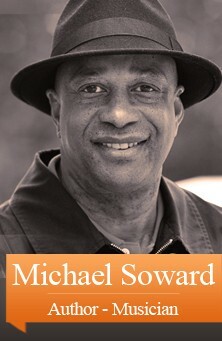 â€œLife-ology101: If All Else Fails, Smileâ€� is an autobiographical chronicle of the life and times of Michael Soward, following his journey from his days as a teenager who came from a strict African-American household to a liberated young adult exploring a nation that was also experiencing sweeping changes. Readers will witness the metamorphosis of a man coinciding with the transformation of an entire society, a domino effect wherein both will never be the same again. Sowardâ€™s compelling narrative contains invaluable life lessons on freedom, on a personal and societal level, and on the great responsibilities that come with it. Online PR News â€“ 24-October-2013 â€“A new novel by Michael Soward, the well known Gospel Music promoter of New York has just been released and is on sale in an electronic format from Amazon, and in Hardback and in paperback which is available at most stores as well as from his own site as listed above. The book itself is an autobiographical novel. In which Michael Soward describes his life's journey and how he came to his philosophy of "If All else fails, smile" The title of the book is Life-ology 101: If All Else Fails, Smile. So what does one wish to know about Michael Soward and his inspirational novel? Well it is the largely factual tour through his life. He was born into an African American family in Milwaukee Wisconsin which lived by a very strict code. He attended Penn Valley Community College. As many teenager did and to comply with the pressures of the peer groups he was a liberated teenager, indulging in drinking, and the various other peccadilloes that teenagers get up to. He experienced many trials and tribulations that many an African American faced by the nature of their skin color rather than for who they were or what they did. But American society was evolving and with Michael Soward's indomitable spirit he overcame these obstacles by sticking to his philosophy of smiling into the face of adversity and never giving in. This is an inspiring tale which describes these challenges and his proven method of dealing with them. He encourages and inspires his readers with many of the difficult lessons in life, dealing with prejudice, dealing with racism, dealing with peer groups and dealing with malice. Before he arrived in New York there were many surprising twists and turns as American society evolved and changed him at the same time. This inspiring tale is a must for all who have heard his music. Michael Soward now serves his community in New York and promotes Gospel Music, Jazz and the artistic endeavors of aspiring writers, songsters and artists. He has built his own career by being persistent and never taking no for an answer when the correct answer should be "Go Ahead". He has studied and become very successful in marketing, promotion and the recording industry and its markets. He has released a number of recordings himself which include a number of albums of Gospel music. His first release was in 1985 and the album "Real Love", a blend of Jazzy type funk music and spiritualized but synthesized Gospel Souls music was ahead of its time but is still appropriate for today. Michael declares that music is his passion in the belief that it is a common language that is able to raise a person's soul to new heights. Read this wonderful tale and absorb the lessons of Life-ology 101 which will encourage and inspire all who read to face up to and overcome the adversities that confront one on a daily basis.